• Selection of basalt breeds from local deposits for fiber production. 3. Organization of joint-ventures for production of CBF, BSTF, materials & products made on its base with participation of BFCMTD. • Processing equipment manufacturing, installation & start-up of technological lines TE BCF 1000-1500 for CBF manufacturing. Including: TE BCF 1000-1500 technological lines and BCF1, BCF2 installations. • CBF & basalt fiber materials technological lines & installations manufacturing. BFCMTD offers technological processing equipment for basalt fiber materials manufacturing, including machines, installations, and technological lines for fabrics, nets, mats, profile plastics, armature, composite materials and basalt fiber products manufacturing. Under the special request CBF materials equipment & technological lines are provided. BFCMTD’s work model implies providing customer with full means for total cycle production, beginning with getting basalt, which is a raw material, and ending with finished products - CBF materials. This kind of total cycle production model is highly effective & profitable: the minimum investment return period is 1.5~2 years. CBF production is based on application of technological lines TE BCF 1000-1500 with productivity 1000-1500 tons a year. The technological lines TE BCF 1000-1500 are the core of big CBF production facility with annual output 3,000 / 5,000 / 10,000 tons. BFCMTD can manufacture, install & launch STBF manufacturing installations, such as BCTB 20M, BSTF 20, BSTF 40, as well as STBF materials manufacturing equipment, such as felts, mats, heat isolation materials, fire-resistant materials, filters and so on. Компания предлагает поставку, монтаж и пуск установок BSk 20, BSk 60 для производства базальтовой чешуи (БЧ), оборудование для производства защитных покрытий и композиционных материалов на основе БЧ. BFCMTD can manufacture, install & launch Bsc manufacturing installations, such as BSk 20, BSk 60, as well as equipment for production of protective wear proof coverings & BSc reinforced composite materials. 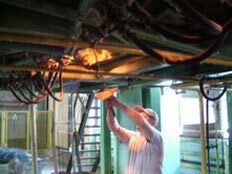 Inspections of thermal-consuming manufactures - audit of energy consumption. Reconstruction projects for heating, thermal, kilning, bell-type & other furnaces, as well as thermal equipment with application of energy saving technologies & energy saving equipment. Whole range of reconstruction and manufacturing works with furnaces & thermal equipment, reducing power consumption by 20~50%. • To reduce power-intensive production manufacturing cost (for porcelain & ceramics products, rolled metal, pipes, rolled sheets, building materials and so on). Company specialists inspect furnaces, thermal equipment, power consuming plants, make an audit of energy consumption, compile energy saving offers, provide technical & economic assessment, economic efficiency evaluation. Selection of priority objects for reconstruction. Performance of design works, heating engineering calculations, preparation of engineering specifications for furnaces, thermal equipment, power consuming plants reconstruction. Reconstruction works, including manufacturing, installation or installation guidance of additional equipment, lining works, reconstructed furnaces & thermal equipment launching. High-temperature materials, composite materials & special application products: glues, materials for bushing fettle, high-temperature materials products (gas or liquid-fuel stoves stones, special products). Under special request high-temperature glues & high-temperature materials for trial or industrial purposes can be provided. Under special request our company can develop & select different high-temperature materials with various application goals.